Lock in a great price for Railay Princess Resort & Spa – rated 8.4 by recent guests! The pools were amazing, food was great, breakfast awesome, rooms were amazing, staff was friendly. An amazing option for Railay Beach in the heart of the action. Highly recommend! Location was perfect for easy arrival and departure and proximity to beaches around the peninsula. The staff was very helpful in arranging our departure to the airport. Place is super convenient right off the floating pier. Great pool. Great resort, amazing staff and comfortable rooms. 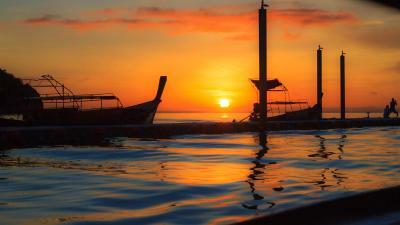 Railay is definetly our favorite destination after this travel! And Railay Princess Resort was a great place to stay while exploring this secluded beach bay. The staff members were always smiling and running to give you a hand or answer any questions you might have. The room was spacious, clean and had everything we needed. It is next to the forest, so there will be some ants in the room, as this is impossible to avoid for any hotel here, but if you tell them, they will come with the bug spray and fix it for you as soon as they can. The training room is small, but also has everything you need. Breakfast was also very nice and varied. The room was big and had a nice view of the inside garden. Everything is on walking distance! Hotelstaaf is nice and helpfull. The breakfast is very good. The food of the restaurant is good, but should be improved the ambience of the space during dinner time (refer negative comments). The terrace swimming pool is a very good place for relaxing from late afternoon and also has a suitable schedule (closes 9:00 PM). Great resort with affordable prices. Room was very spacious and bed big and comfy. Location is amazing - Railay is simply stunning, but because resort is located on east side the prices are lower than on west side and it’s just 5 mins walk to Railay beach and 10 mins walk to Phra Nang beach. 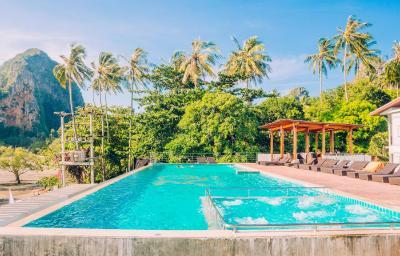 Resort has two amazing pools, one on the rooftop with great view and one more quiet hidden within the palms. Food a la crate was very good, Friday buffet was delicious, breakfast was ok. Absolutely wonderful stay. Staff is exceptionally polite and helpful. Restaurant is great, and general service surpassed our expectations. Staff genuinely seemed to not only like working there, but liked each other. Would definitely recommend to others and would for sure stay again. Railay Princess Resort & Spa This rating is a reflection of how the property compares to the industry standard when it comes to price, facilities and services available. It's based on a self-evaluation by the property. Use this rating to help choose your stay! Just a 5-minute walk to Phranang Cave beach on the peaceful East Railay Bay, this hotel offers 2 outdoor swimming pools and a fitness center. Rooms at the Railay Princess Resort & Spa have Thai-style furnishings and include a satellite TV, a seating area and a private balcony with garden and pool views. Guests can enjoy a relaxing Thai massage at the Waree Spa. Other facilities include kids' club and laundry service. 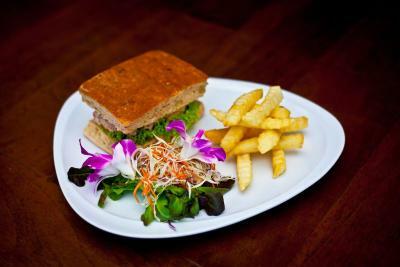 The Princess Restaurant serves Thai and international dishes prepared with seasonal ingredients. The Phranang Lagoon and the Phranang Cave are 5 minutes away by foot. 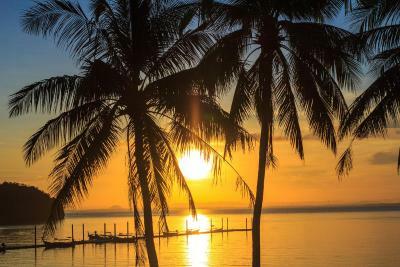 Krabi Airport is 20 mi away and an airport shuttle service can be arranged at an additional charge. Free private parking is available on the mainland at the Ao Nam Mao office. 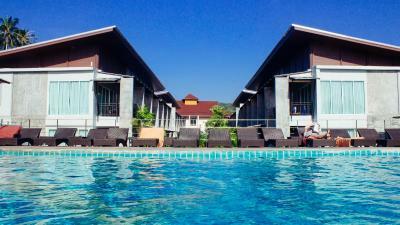 When would you like to stay at Railay Princess Resort & Spa? 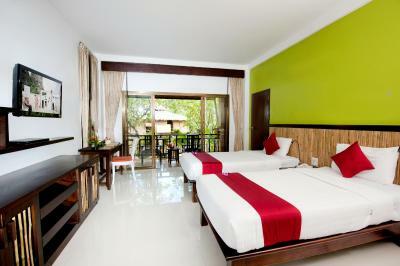 This air-conditioned room is fitted with a private balcony, a satellite TV and a minibar. Free toiletries and a hairdryer are included in a private bathroom. 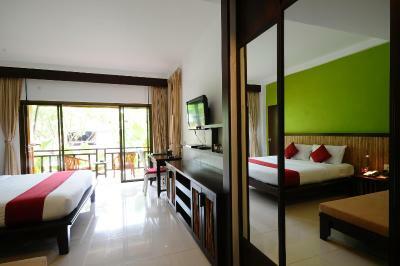 Larger air-conditioned room features a private balcony, satellite TV and a minibar. Free toiletries, a bathtub and a hairdryer are included in a private bathroom. Located on the top floor, this larger air-conditioned room is fitted with a private balcony, a satellite TV and a mini-bar. Free toiletries, a bathtub and a hairdryer are included in an private bathroom. 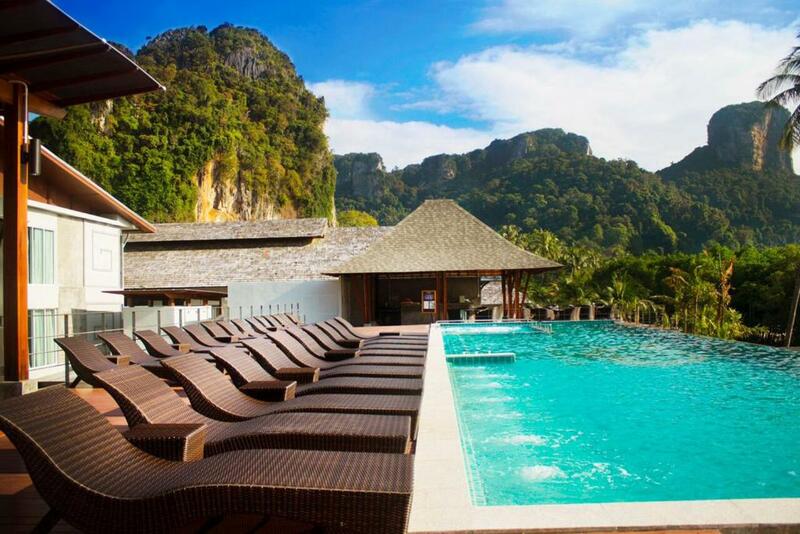 House Rules Railay Princess Resort & Spa takes special requests – add in the next step! Railay Princess Resort &amp; Spa accepts these cards and reserves the right to temporarily hold an amount prior to arrival. Railay Princess Resort & Spa accepts these cards and reserves the right to temporarily hold an amount prior to arrival. 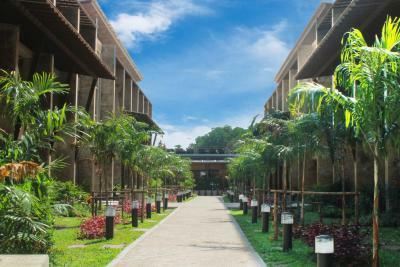 Railay Princess Resort & Spa offers a transfer service from Krabi International Airport at an additional charge. Guests are kindly requested to inform the property in advance if they wish to make use of this service. Contact details can be found on the booking confirmation. Please inform Railay Princess Resort & Spa of your expected arrival time in advance. You can use the Special Requests box when booking, or contact the property directly using the contact details in your confirmation. 1. Breakfast too locally oriented. I ended up eating only fruit. 2. West beach 5 minutes walk but no chairs available only for guests at hotels on west side. 3. Somewhat smelly around kitcen area. 4. After paying 14000 thb i was asked 45 thb for water bottle. 5. No real evening entertainment. 6. When arriving, make yourself a favour, pay a little extra and reserve hotel shuttle. Especially after sunset. 7. No help with luggage at checkout and walk to west coast for ferry. No pier on westside and longboats are in water. Maybe nice for backpackers, not so with suitcases. Breakfast was excellent. Large variety of food and drinks and staff who never let your tea or coffee go empty. 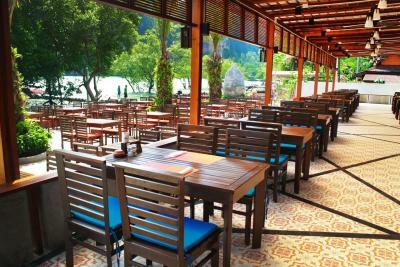 The pool area is very pleasant situated above the restaurant with a nice view of the beach and surrounding mountains. Also there was a second pool which was partly covered by shade which was also nice. The superior room was great. It was clean, comfortable and spacious with a large balcony which would be occupied by monkeys at times. 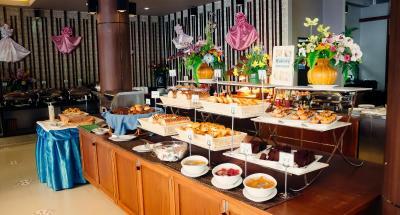 Everything was perfect!Amazing breakfast,nice swimming pools,staff very helpfull!! !Room was spacious and had a nice and big balcony with good view to the lake! Honestly, it's not easy to talk about what I didn't like and I just wish this will never happen again. When my husband and I arrived to the island, we had an amazing welcome from the staff of the hotel, an amazing room, amazing conditions. Everything was perfect! Then, when I was preparing to sleep, I went to the toilet, and I saw a cockroach on the wall and it was ok (it's normal with the weather conditions and you are on an island). We totally understood and we just called a staff member to bring a product to kill the cockroach and see if there was more. When the staff member arrived with the product, he sprayed the product and then many cockroaches started to appear. In total, were 8. And it was my husband that killed, because the men just sprayed and started to see our tv from the room (we was not worried at all even if there will 20 cockroaches). Then, the men from the staff went away and nobody asked us if we wanted to change the room (in my opinion, that's exactly what a 4* hotel/resort should proceed). Then, I called to the reception and asked if we could change the room and you could understand that they were not happy to change us to another room, but they did it. Then, everything went ok, we were happy with our stay, we went to another island and then we came back to the same hotel. Honestly, the amount of tourists increased and I felt that the majority of the member staff were not nice, everytime you were asking for something, they were not nice at all and the environment was not so peaceful and, in my opinion, they need to improve a lot on their smile and their service. Anyway, we were happy with the island and we were enjoying a lot!! Last night - more cockroaches. Ok, we were on the last night, we just called a member staff to sprayed a product and we didn't even say nothing. The view from the pool (unbelievable and peaceful), the breakfast (good variety), the peace (almost no noise) around the room, only 5 minutes walk to the beach (Railay West) and 2 minutes till the "main street" (with all the bars/restaurants/shops). The pool was very busy in the evening with many people loudly grouped and stood in the pool, or others reserving sunbeds with towels then wandering off so not much room to sit. However the atmosphere was good, just not as relaxing as we had imagined. The island is very crowded and there is a significant amount of litter building on the beaches which is really sad. A real shame for what otherwise is a stunning place. Bed was comfortable, room was clean and pleasant. Air conditioning was great, and very necessary in the heat. Our room had a bath which was lovely. The pool is in a beautiful location and we were able to have drinks by the pool which was perfect. The hotel is well located to book excursions as the pier is directly outside of the hotel. Breakfast has a large selection. Cleanlines, everything was very clean and the people from the hotel always smiling. Too much plastic being wasted - straws especially. It is very hard to find staff that speak English in a way that you can ask for anything you might need. We bought tickets to another island at the reception in the morning, at night we got a call saying that we needed to pay 200 baht more because the lady made a mistake. There was no explanation whatsoever or an apologie (again it was very frustrating to have a conversation due to the level of English). The next morning we checked out because we needed to go to the boat and we were told that we could not leave until someone checked the room (even though everything was paid). I said that this did not make any sense and asked what needed to be checked but got no answer. After 10 minutes they said it was ok to go and again no apology or thank you for the stay.